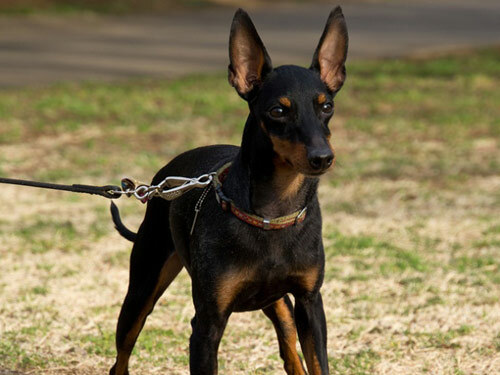 Originating during the 16th century in Manchester, England, the Toy Manchester Terrier was prized for their ability in helping to control and eradicate rodents and fox. They also enjoyed popularity as watch dogs and as companions. The Toy Manchester Terrier possesses an alert and bright expression. They are hardy and sturdy, het elegant and sleek. This breed is agile, athletic, discerning, and observant. A lively, high-spirited breed, the Toy Manchester Terrier is also faithful and protective. They do not do well if left alone for extended periods of time and are very demanding when wanting attention. If they become bored or lonely they will become destructive and bark incessantly. Toy Manchester Terrier's do not do well in homes with dogs or other household pets. They do will with older, considerate children. Occasional brushing with a firm bristle brush is recommended for the Toy Manchester Terrier. Bathing should be done when necessary. It is important to regularly clean the ears. The breed is prone to such health issues as Von Willebrand's disease and glaucoma. The coat of the Toy Manchester Terrier is glossy, short, smooth, and dense. The Toy Manchester Terrier requires a dominant owner. Intense early socialization and obedience is a must. They will not respond to harsh or heavy-handed methods. Training must be done with firmness, fairness, and consistency. The Toy Manchester Terrier breed will do okay in an apartment provided they are sufficiently exercised. They thrive on being with their family and enjoy securely leashed walks and free-play in a securely fenced yard. The Toy Manchester Terrier excels in agility and obedience.